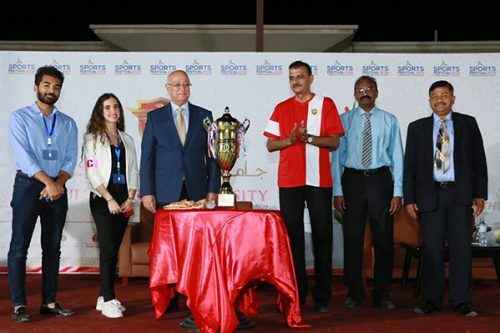 The 18th annual Sports Festival of Gulf Medical University (GMU), Ajman, got off to a colorful start with the inaugural ceremony on the 9th of February 2019, at the GMU campus. Prof. Hossam Hamdy – Chancellor of GMU, the chief guest of the opening ceremony, inaugurated the week-long event. A colorful march-past of the participating teams followed by the torch-lighting ceremony which officially marked the start of the competitions, were the highlights of the opening ceremony. The torch was lit by Prof. Manda Venkatramana, Vice Chancellor – Academics, GMU. Considered the biggest sports festival of the country, this year’s edition of the event has the participation of students from 26 different colleges and universities, competing in 226 events across 10 categories, over 6 days. The teams will vie for prizes in the following game categories: football, cricket, basketball, volleyball, table tennis, tennis, badminton, throw ball, squash and swimming. Medals and trophies for the winners will be distributed at the closing ceremony on Thursday, 14th February 2019, at GMU. All participants will be awarded certificates of participation. The grand sports event is held each year keeping in view the philosophy of Gulf Medical University “Healthy Body for a Healthy Mind” and to instill the spirit of sportsmanship and healthy competition among the students. The event has been helpful in engaging the student community in the UAE and empowering them in terms of the positive influence of sports.